Ksar, plural ksour (Maghrebi Arabic: قصر qser, plural qsur) is the North African Meghrebi Arabic term for "castle", possibly loaned from Latin castrum. 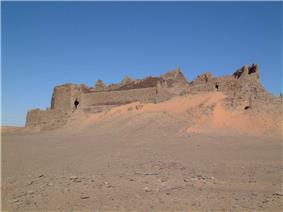 Qasr, a variation of this word, is used for 'palace' or 'castle' in Syria, Jordan and other countries. The Berber (Amazigh) original word for "ksar" used in North Africa by the Berber-speaking populations is aghrem (singular) or igherman (plural). 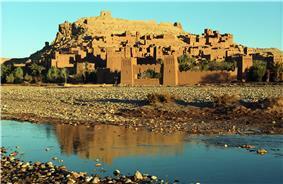 In the Maghreb, the term has a more general meaning of "fortified village,"or "fort". The Berber word igherman might be a cognate word, with an identical meaning, with the word Garamantes, which is the name of the ancient Berber city-states in modern-day Libya. Ksour in the Maghreb typically consist of attached houses, often having collective granaries and other structures like a mosque, bath, oven, and shops. Ksour / igherman are widespread among the oasis populations of North Africa. Ksars are sometimes situated in mountain locations to make defense easier; they often are entirely within a single, continuous wall. The building material of the entire structure is normally adobe, or cut stone and adobe. The idea of the ksar as a granary is a confused notion of two things, the granary itself, found within a ksar, and the ksar, which is a village, normally with granaries within it. Ksars form one of the main manifestations of Berber architecture. The word is part of place names across Morocco, Algeria, and Tunisia, — the region called the Maghreb; and is particularly prevalent on the Saharan side of the various ranges of the Atlas Mountains and the valley of the Draa River. The Spanish terms Alcázar and Portuguese Alcácer are derived from this North African Arabic word, and appear in place names and buildings originating as fortresses.